Cycle Chic®: Why Do We Ride? Some of our visitors have commented about how petrol and car prices are much higher in most European countries compared to the US, for example, and that is perhaps why Copenhageners ride their bikes so much. It's important to remember that our standard of living is different and these prices, while high, are not prohibitive to us. In the rural provinces in Denmark, like many places, young people buy a car as soon as they get a driving licence, so it's obviously not difficult to acquire an automobile if you want one, even with 180% tax on cars. The point is that we don't need to drive in Copenhagen. Copenhageners ride bikes because they can. Because it's easy and fast. The statistics back this up. 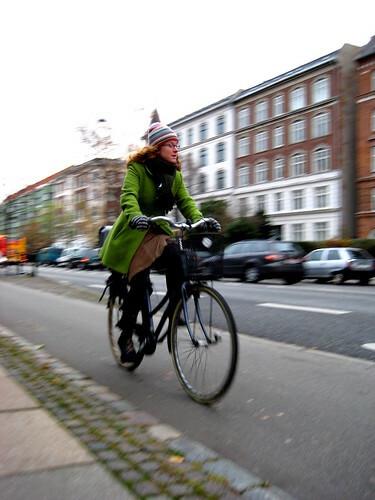 The City of Copenhagen publishes a biannual Cycle Policy Report - a kind of state of the bike nation - wherein they gauge progress and problems and revise our goals. In the 2006 report, for example, the goal of having 40% of Copenhageners riding their bike to work or education was revised to 50% by 2015. 19% ride because of the benefits of excercising WHILE using the bike as transport. (Not fitness). Bikes are used primarily for transport, not for excercise. 50% ride up to 50 km a week. 15% ride more than 100 km a week. 68% ride for other errands apart from work. 17% ride only for recreation/excercise. 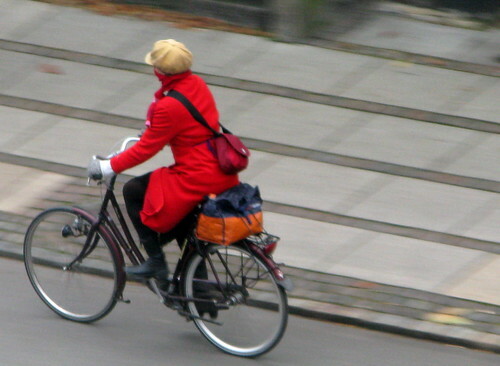 In all, 73% of Copenhageners DON'T ride for recreation. The bike is not a hobby article used for recreation or excercise. It is transport. The fact that riding a bike is beneficial to your health is listed as a secondary reason of 38% of those polled. 51% mention how easy it is as their secondary reason and 45% say it is because it is fast. Why do YOU ride where you are? Let us know. That's not good news for more cycling in the US, because compared to driving, cycling is not especially fast and easy here. To the extent that higher gas prices get people off of roads (but not necessarily onto bicycles) driving will get even easier and faster. I bike for a combination of health and politics; I need regular exercise, and I think that excess energy consumption is the cause of too many of our (national) problems. Great comment. Thanks for taking the time to write. The UN Climate Panel's report is out today and it looks like everyone is going to have to do more for the climate. Hmm... I ride because I can. Because I get restless if I don't. To and from school. To and from work. To and from friend's. 5 or 50 km's, because it's not the destination, it's the trip (ok, unless when I ride to school). Because I hate public transportation. And cars. Because I care for the environment. Because it gets me there faster than the bus. Because it's fun. Because it keeps me fit. I ride singlespeed (not fix) and I ride on the streets, on the open roads, in the forest. Close to 150km a week, and that's just commuting. Then there's the trips to the various mtb tracks around Cph, that I visit whenever I can find the time. Because I love to ride and because I love bikes. I ride when it's (relatively) safe to do so. I ride for several reasons, including politics, lifestyle, pleasure, and participating in global transformation during the time of Peak Oil. When not riding, I take public transportation because driving alone in a big steel cage hurts the earth more than it helps me be something that I'm not. Folks in the US typically don't see it their responsibility to participate in the betterment of the world. "I". "Me". "Mine". That's the usual way of people here. Europe has such a rich variety of ideas and implementations of those ideas. Bicycling is just one dimension of the culture. It's delightful to watch, even if it's from afar. Great to hear why you both ride. I ride because it is easy and fast. I have 5 km to work but in my car it takes longer, so I ride. the freedom of the bike lanes can't be beat. Excuse me for being geographically illiterate, but is Copenhagen relatively flat? That is my impression from the many National Geographic's that I have seen. One of the big obstacles to bicycling being a more viable choice for getting around in the US is that we are so suburban. Everybody with their own American Dream. I like feeling like a kid at every opportunity. In my city, Binghamton, NY, we have just finished a major section of a "greenway" going from a long park all the way into the center of the city. The city and the State Dept. of Transportation are also putting in bike racks (though I think they will have to do some educating in order to get people to understand what they are for)and will be building another long section of greenway from the other end of the county. I am now able to ride from my residence(which is in the country and surrounded by farms and suburban area)to my job and except for the first two miles, I am on the greenway and off the roads. The big issue in the US in terms of growing the use of bikes is safety. We have too many cars, too many high speed roads, and too many drivers who do not pay attention to wha they are doing. Cities with the highest bike use - Cambridge, MA, New York, NY, and San Francisco, CA - also have the highest rate of pedestrian and bike deaths. Until we can make biking safe, people will not take to it here. In the meantime, I can bike to work and THAT is a tremendous luxury. thanks for your comment, twollin. Great to hear what it's like to ride where you are. 'Safety' is something that many North Americans mention. I think that the primary issue is infrastructure. If you build it, they will come. And, as a result, 'they' will see that riding on dedicated bike lanes is 'safe'. It's all intertwined, of course, but investment first and safety will follow. Hope to hear your point of view again. Feel free to comment anytime. i ride 30-50miles together, to and from/to work from college/back home. training for the Ironman, no other reason.... oh i get 15min extra time to sleep in morning because i can set off later than i would if i got the bus to college. I ride because I enjoy it, I like being green and I like the exercise. 20 miles roundtrip to work takes me from 30 to 45 minutes here in Pennsylvania, United States. In the last 5 years or so my commute by car has gone from 20 minutes to 30 minutes so with better parking at the door for my bike I am starting to save time along with money. By the way I work for a Danish company and many of my Danish coworkers think it is very dangerous to bike here in the United States, I tell them I have been riding in traffic here for over 50 years so I guess I am used to it. I am planning a trip to Denmark this summer so I hope to cycle in Copenhagen when I am there. Dear Zakkaliciousness, I am looking for a note about the basic political way of looking at cycling in Köbenhavn. Is there a general view of the State that on fast and very much used (by cars) roads there should be cycle paths or lanes? And if yes, where do I find that? I ride in LOS ANGELES for all those reasons in the survey, plus I do it also because it's just plain FUN. I'm pushing 40 but I feel like a kid when I'm on my bike and that's a good thing. Twollin hit the nail on the head. Riding bikes on or near a road in the U.S. is extremely dangerous due to fast, distracted, & numerous drivers. I wish that bike lanes were enough, but they aren't. At the very least we need completely separated bike lanes, but bike trails/paths would be better. Unfortunately, some of our politicians are using the current economic situation as an excuse to cut back on trail building rather than building more trails, which would be the correct solution.